Seventy five years ago my father Jerry Haire was fighting for his life on Timor Leste. Outnumbered by the Japanese, he and around 300 commandos of the 2/2 Australian Independent Company had refused to surrender. With a price on their heads they continued to hit and run and sabotage. Cut off from Australia for 6 months they were presumed dead. In desperate need of supplies they were eventually able to construct a radio of tin and wire to get through. Haire had volunteered in 1939 but as a school teacher was rejected. He persisted and in 1941 was invited to join a special “hush hush” unit: Australia’s first commandos. He had all the required attributes: superior intelligence, language skills, bush craft and above all fitness. A former State Champion in track and field, Haire later coached high jumper John Winter to Olympic Gold. The commandos were shipped from Australia in December 1941. Believing their destination to be dry desert and flat sand, they were ill equipped for tropical jungle and mountains. Because they treated the East Timorese kindly the Australians were for the most part welcomed. Each commando was assigned a criado, a boy aged between 14 and 16, without them and the support of their villages the Australians would not have survived. Haire’s first criado “disappeared”, believed murdered by the Japanese, his second remained with him until his return to Australia. Haire was Mentioned In Dispatches: “A sub-section of about six men led by corporal Jeremiah Haire, 34, a schoolteacher from Denmark WA, hit the Japanese at Fac-Lou, about 3 km east of Remexio. Striking at a range of about 200 metres, Haire’s men claimed 25 casualties”. (The Men Who Came Out of the Ground – Cleary 2010). Throughout that time Haire kept a diary – illegally due to the danger of it falling into enemy hands – written in pencil and without his comrades’ knowledge. Haire departed Timor Leste in November 1942. To Macaulay I say “Goodbye”. Poor kid is broken hearted, his large eyes swollen with crying, overflowing with tears. I try to soften down the parting by giving him my knife (I have little to give), and promising that I shall return when we shall resume our partnership”. (Diary – Haire). During the voyage Haire shared his diary with Damien Parer who’d filmed the commandos for his documentary “Men of Timor”. Parer made notes from the diary, an extract from it is included in The Men Who Came Out of the Ground. Haire moved to Intelligence, eventually accompanying (General) MacArthur to the Philippines. 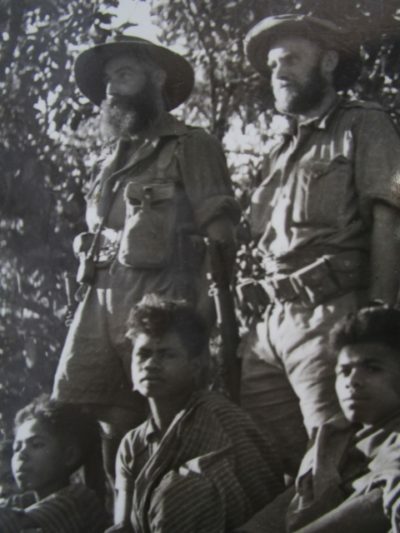 In the mid 1960’s Haire and fellow commandos visited Timor Leste to render the East Timorese the assistance long promised them by the Australian Government. He was thrilled to be united with his second criado, now a father of 6, donating to his family and towards a permanent memorial to the East Timorese. Haire died in 1990. From Col Doig’s obituary: “Everyone who came in any way under your influence is the better person for it. So goes a great and truly humble person to rest with the God he so revered”. From Don Turton’s eulogy: “…a distinguished man in his profession and in the state sporting arena. Jerry was an exceptional, considerate and kind man”. Throughout his life Haire spoke of “the wonderful self-sacrifice of the kreado” (Diary – Haire/The Men Who Came Out of the Ground). I first encountered the Josephite sisters in the late 1950’s at a small primary school in Kensington WA. Some of my teachers remained close to my parents, visiting them until their passing. I am honoured to be associated with MMI due to the debt my father, me and Australia owe the East Timorese, because of the inspiring sisters who founded it and that it operates without fanfare, a quality shared with the late Jerry Haire.